Roelof Grootenhuis at Karl Strauss for the SDSU Business of Craft Beer Program graduation where he received his Level 2 Certificate. With a degree in economics, Roelof Grootenhuis worked in business operations for several pharmaceutical and biotech companies in the Bay Area and San Diego before realizing it wasn’t the right career fit. When his father’s health began declining, he had an epiphany. Despite the unlikelihood of such a niche job description, Grootenhuis is doing exactly that. 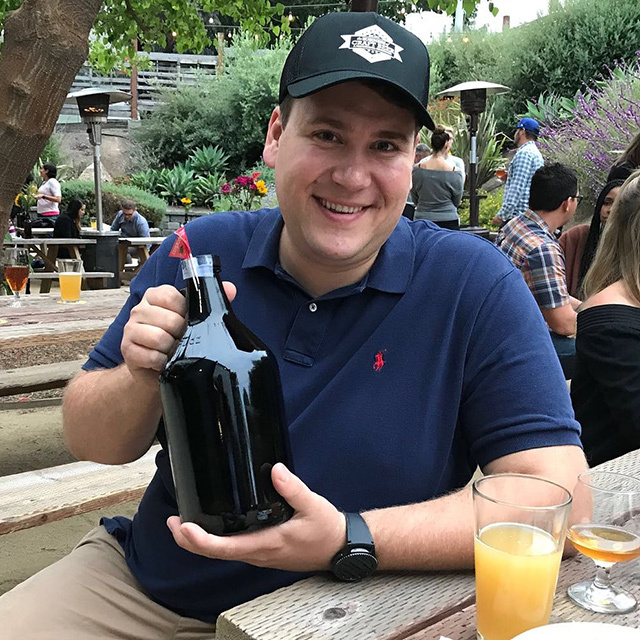 With the help of SDSU’s Business of Craft Beer program, he’s the sales, product, and labor cost analyst for 3 Local Brothers, proprietors of Urge Gastropub and Mason Ale Works in North County. “This position has been extremely rewarding, as it has given me a much better understanding of the financial drivers of success in the craft beer world,” said Grootenhuis. He answered a few questions about his career and his journey through SDSU’s program. Please give us a brief history of your education. I am originally from The Netherlands, but moved to San Diego at a very young aged and have lived here the vast majority of my life. After attending K–12 in San Diego, I did my bachelor’s degree at U.C Berkeley, double majoring in economics and Dutch studies. When did your love of beer begin? While studying at U.C Berkeley, I was fortunate enough to be nominated by one of my professors for a scholarship granted by a language organization within the Dutch government. I ended up studying Flemish language, history, and culture at the University of Ghent for a summer, and one of the electives I took was an Intro to Belgian Beer class. I became fascinated by Belgian beer culture and Belgians’ pride in their craft. Beer was only served in its brewery’s official glassware, and the depth of beer styles on offer was incredible. When I tried my first Gueuze from Brasserie Cantillon at a Jazz Cafe in Brussels, I was hooked and became incredibly interested in barrel aging techniques as applied to beer, and the concept of spontaneous fermentation. Give us an overview of your first job in the craft beer industry. I was fortunate to get hired at Viewpoint Brewing Company when it was opening in Del Mar. I started as a busser, eventually working my way up to being a tap server and after some time I was offered a position in the brewery as an assistant brewer. Since brewing beer commercially was my dream, I accepted and learned so much about beer production from brewers Moe Katomski and Cody Cuchna. After some time, I realized that while I love to brew as a hobby, a career in brewing was not right for me. How did you find out about SDSU’s Business of Craft Beer program? I found out about the program in an advertisement in the West Coaster, if I recall correctly, and knew immediately that I wanted to start taking classes after I read about the instructors and the content. At the time, I had just started my job at Viewpoint Brewing Company, and I figured the program would be a great way to deepen my knowledge and meet like-minded people. I wanted to learn as much as possible about beer styles, brewing processes and techniques, and front of house management. My ultimate goal was to complete the Level 2 certificate within a year, which I was able to accomplish. 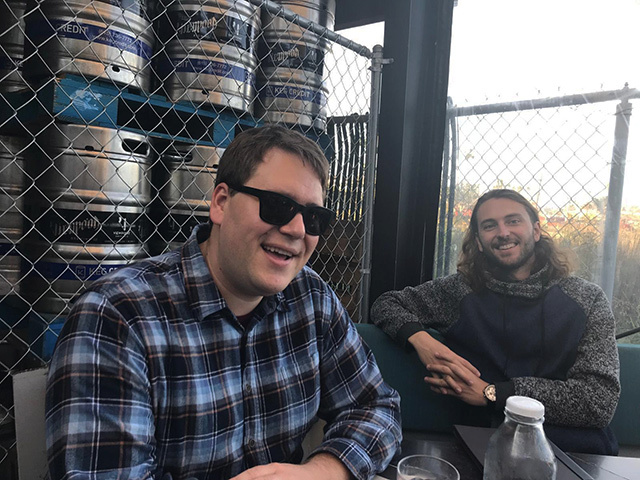 (L to R) Roelof Grootenhuis at Viewpoint Brewing, enjoying one of the brews he helped make with brother-in-law Cody Schaaf. I thought Debra Druther’s Finance course was really interesting. She brought in some really interesting guest speakers and the material she conveyed was really useful in terms of understanding key metrics of success or failure for a brewing operation. I apply concepts from that course to my job every day. George Thornton has got to be one of the most knowledgeable beer enthusiasts in San Diego. In Beer Styles, he taught us about current hot topics like Hazy IPAs, but also made plenty of time to talk about interesting niche styles like Weizenbocks, Doppelbocks, and Roggenbier. Chad Heath’s The Business of Distribution class was great for understanding the whole distribution chain and the mechanics of distribution contracts. If you want a good laugh, definitely ask him about brand ambassadors, or “smileys” as he likes to call them. Laurie Delk’s Marketing Craft Beer class taught me a lot about the power of social media and inbound marketing, and ended on an inspiring note as each student presented their own brewery marketing plan to the class. “Dr.” Bill’s class, Exploring Craft Beer, also got me really excited about the program and led me to read several of Michael Jackson’s books, greatly improving my knowledge of beer history. Honestly, every class I took was enjoyable in a different way. Each of the instructors that I had the privilege of working with were true industry professionals. They’ve gotta have more than a hundred years of combined experience among all of them. It was a true honor to learn from them and I am very grateful for the fond memories I have as well. How was the camaraderie with your classmates/fellow beer lovers? It was great! I got to know some really interesting people who I often see around town on a regular basis. This industry is very incestuous, so all I can say is that you will run into people a lot more than you think you will. It was really nice to meet people who really care about beer and becoming more knowledgeable about it. How long did it take you to earn both certificates? I completed Level 1 in about 7 months, and Level 2 after about a year! I did take several classes at a time while working full time, but I never felt overwhelmed and thought that it was very doable in that amount of time. Did you learn things you could immediately apply to your work? Almost every class I took through the program was applicable to at least one facet of my job. Michael Peacock’s Draught Systems course prepared me for brewery tasks like line cleaning and other draft system maintenance, and learning how to use a jockey box allowed me to work events for Viewpoint on a regular basis. Dave Adams’ Front of the House Management class taught me so much about what true hospitality means, and how to handle tricky situations with guests, as well as a plethora of technical knowledge about packaged beer (his tirade about dissolved oxygen was epic) and tasting room operations. Taking George Thornton’s Beer Styles course taught me a ton about beer styles, allowing me to go far beyond simply serving a beverage; I became a true bartender who could make accurate personalized recommendations as I got to know my regulars. In my current position, I apply concepts every day that I learned from Debra Druther’s Finance class, Chad Heath’s Distribution class, and Matt Johnson and Candace Moon’s Brewery Start-Up class. Did you have any helpful networking experiences, either with fellow students or instructors? One of the guest lecturers in Debra Druther’s Finance class was Grant Tondro, one of the Founders of 3 Local Brothers (proprietors of Urge Gastropub, Mason Aleworks, The Barrel Room, and Brother’s Provisions). Grant gave an amazing lecture about key financial metrics for gastropubs and breweries, and told the class really interesting tidbits about his operation. I spoke with Grant a little bit after class, and he really took the time to answer a few questions I had despite it being almost 9:30 pm on a weekday. I followed his company online for some time, and as fate would have it, an interesting hybrid accountant/analyst position opened at his company several months later and I was lucky enough to be hired. How did the program help you attain your goals? I can honestly say that the program helped me attain my goals in every aspect of what I hoped to get out of it. Technical knowledge, career development, networking, personal enjoyment, the whole nine yards. It also definitely played a major role in terms of providing me with the qualifications I needed to get hired at, and to be effective in, my current position. I was most surprised by the diversity of the students enrolled in each course. Each class was composed of a mélange of homebrewers, industry people, aspiring brewery owners, and international students opening new businesses in other countries. And of course, people who simply love beer! Basically, lots of interesting perspectives in the classroom. Thank you for asking for the top three! I could never pick just one. I would say Cantillon Mamouche (barrel-aged wild ale with elderflowers), Russian River Blind Pig IPA , and De Garde’s The Kriekenbloesem (barrel-aged wild ale with tart cherry blossoms). I 100% would just because regardless of whether you are a seasoned industry veteran, considering a career change, or simply interested in beer, there’s a lot you can learn from this program and the fantastic instructors and students it’s comprised of. A pilot, but my eyesight sucked. So there goes that plan! Just like anything else in life, what you get out of this program is a direct extension of what you put into it. If you take your assignments seriously, study the material diligently, ask thoughtful questions, and make an effort to meet new people around you, you will surely find it a very enriching experience.